Stay Among the Bears in the World's Most Remarkable Rolling Hotel—on the Tundra Itself! This is simply the most extraordinary polar bear experience available. Stay at the Tundra Lodge, situated outside Churchill directly on the vast expanse of the tundra near the edge of Hudson Bay. The lodge offers round-the-clock proximity to the bears, with views from the main lounge, open-air observation platforms, or individual private cabin windows. Half-day Polar Rover excursions take us farther afield in search of more polar bears and other northern wildlife. As evening falls, remain in the domain of the polar bear to experience the lingering sunset across the snow and ice. Safe inside our warm lodge, we enjoy surprising comfort, considering our austere environs. This custom “train” of connected lounge car, dining room and sleeping compartments is built on wheels, allowing us to station it for optimal bear viewing each season. There’s no more thorough immersion in the polar bear's Arctic realm than on this most distinctive northern adventure! What Makes Our Tundra Lodge Adventure SO Special? Our exclusive Tundra Lodge—an innovative accommodation with no peer in Churchill (or anywhere)—is simply the most remarkable way to immerse yourself in the polar bears' world. A stay at the Tundra Lodge puts you directly in the bears' wild habitat around the clock. The Best Polar Bear Viewing Spot on the Planet! Each September, our mobile Tundra Lodge is strategically placed on a small spit of land that juts out into Hudson Bay. This private location is where the ice first begins to form on the bay, attracting polar bears at the very beginning of the bear-viewing season. Tundra Lodge guests stay in the very midst of the most concentrated polar bear activity in the world! You won't find a more engaging way to spend leisurely time observing polar bears than from our Tundra Lodge. Aboard this rolling hotel fashioned after a train with sleeper cars, each guest has a compact individual cabin with sleeping berth—plus your own private window through which to watch bears and, if we're lucky, the northern lights, too! Large outdoor viewing platforms with steel-mesh grated decking further enhance bear-viewing possibilities. From the Tundra Lodge's extraordinary location, you won't miss a thing, since you don't have to go back to town at night! There are just two companies that possess exclusive permits for the entire Churchill Wildlife Management Area (WMA) where the best, and sometimes only, polar bear viewing occurs. Of course, Nat Hab, in tandem with our partner Great White Bear Tours, holds such a permit. Other operators use school-bus-type vehicles that are confined to the paved and gravel road to Halfway Point—which, as the name suggests, is only halfway to the prime polar bear area. If you're coming to Churchill to get close to polar bears, be sure you choose a trip that offers the fullest access to the bears' prime habitat. Our Polar Rovers Are the Most Impressive Vehicles in the North! Our custom-built Polar Rovers have an advanced drive train that allows us to safely cruise over the tundra with virtually no chance of breakdown, plus a custom-designed heavy-duty suspension system that steadies the ride over the uneven terrain. And, with onboard flush toilets (rather than unpleasant drop buckets), our guests enjoy a superior level of comfort. See more details on our Polar Rovers. Built into the rear viewing platforms of every Polar Rover—and into the platforms that separate the "cars" of our Tundra Lodge—is an exclusive feature that greatly enhances our polar bear observation: grated steel mesh decking that we can see through, so you're able to get within mere inches of the curious bears that sometimes walk beneath the platforms! Natural Habitat Adventures is known for its small groups, including the smallest groups in Churchill. While it may cost us a little more to keep our groups small, the benefits are worth it. The Tundra Lodge accommodates up to 29 guests, leaving plenty of room to view bears through sliding windows and ample deck space. Our Polar Rovers hold 30 or more passengers, but we generally travel with just 15 per vehicle when we head out from the Tundra Lodge to look for bears on the tundra. Every guest thus has plenty of space to spread out, angle for photos and enjoy watching wildlife without being bumped or interrupted by other travelers. To achieve the most time on the tundra viewing bears, rather than waiting around airports and enduring the hassle of security screenings, we charter our own private aircraft to take us directly from Winnipeg to Churchill at a time most convenient for us. We know you'd rather spend your precious time with the polar bears, rather than waiting in airports. We are proud that Natural Habitat Adventures is known worldwide for employing the highest-quality guides in the industry. Our Polar Bear Expedition Leaders have been guiding these trips for an average of at least 10 years each. 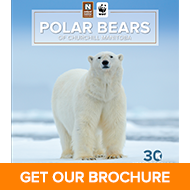 They also receive additional training from WWF's top scientists—you won't find more knowledgeable guides in Churchill! These congenial professionals meet each guest in Winnipeg and travel with the group throughout the trip, sharing their insights every step of the way. Our philosophy is simple: a nature adventure is only as good as the guide who leads it, so we simply must provide the best! See Expedition Leader bios and traveler comments regarding the quality of our leaders. With Natural Habitat Adventures, you receive our exclusive guarantee that clearly states that we will meet the high expectations we set forth in our promotional materials. To our knowledge, this is the most ambitious guarantee made by any adventure travel company. Read our important promise. We all care about the planet, and you can travel with us knowing that the emissions from your trip are 100-percent carbon-offset. 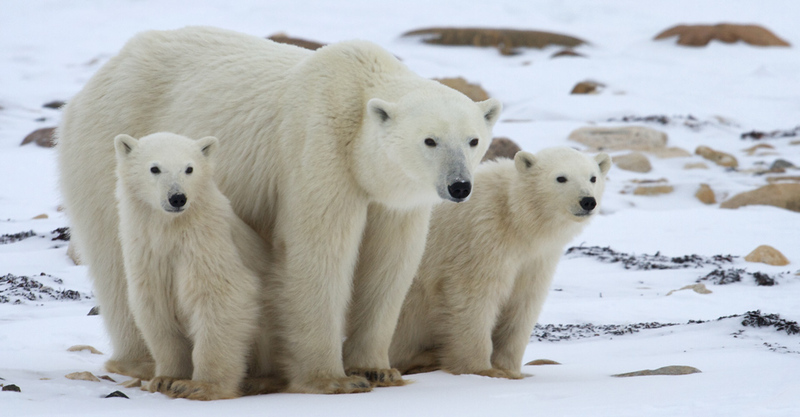 Natural Habitat Adventures is the world’s first carbon-neutral travel company, a feature that is especially critical when considering that polar bears are under substantial threat from our planet's warming temperatures. Because of our commitment to environmentally friendly travel, as well as the exceptional quality of our small-group nature adventures, World Wildlife Fund, the world's leading environmental conservation organization, has named Natural Habitat its worldwide travel partner—a designation that makes us exceedingly proud! Discover a side of China most travelers never see on our unique itinerary crafted to reveal rare panda habitat, diverse wildlife and Chinese nature at its most entrancing—including close-up panda encounters. Fill out the form below to receive additional information about our Tundra Lodge Adventure. Hi Nat Hab, I’m interested in your Tundra Lodge Adventure. Can you please contact me with more information?